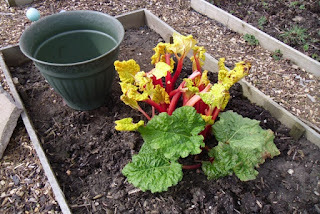 This year we've tried 'forcing' rhubarb but keeping it in the dark. 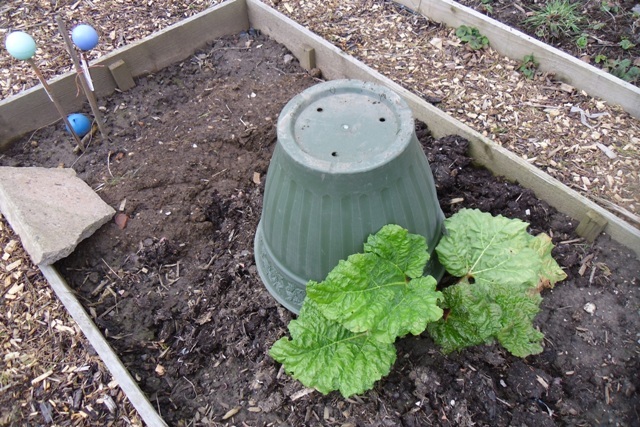 You can see how different it is compared with the stalks which don't fit under the container. 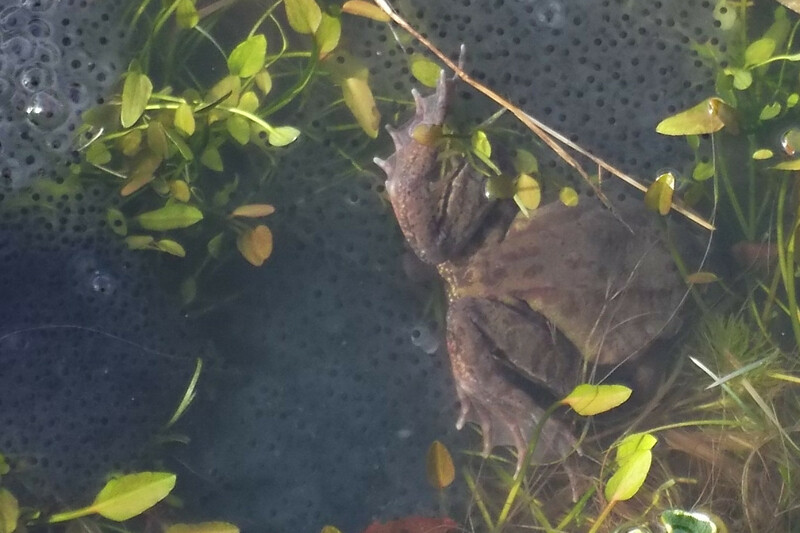 Time to harvest it next Saturday! 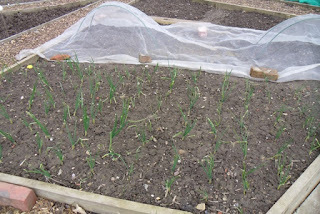 Onions sown in November are doing well, and onion sets sown this week and last are biding their time. 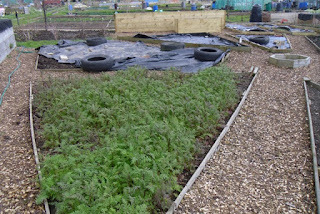 This is the green manure crop Phacelia. It is grown to protect the soil and to provide organic matter when it is dug in. But Phacelia isn't supposed to over-winter! 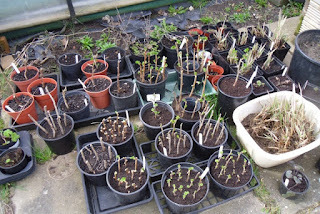 It just goes to show what a mild winter we have had. 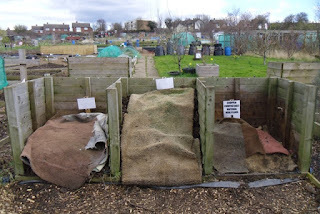 The compost bins were turned a couple of weeks back and all is looking snug. 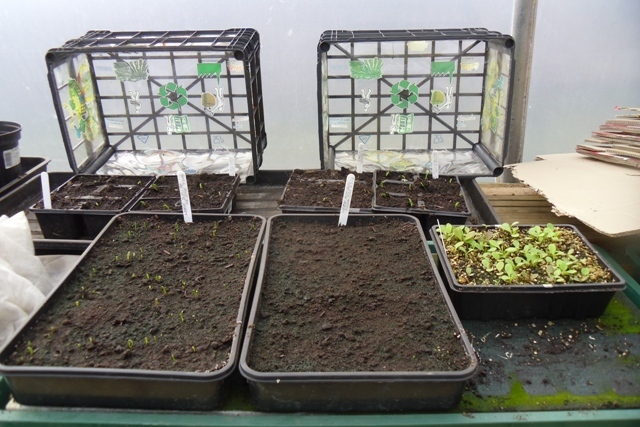 Heritage peas and leeks and Morton's Special Mix lettuces. 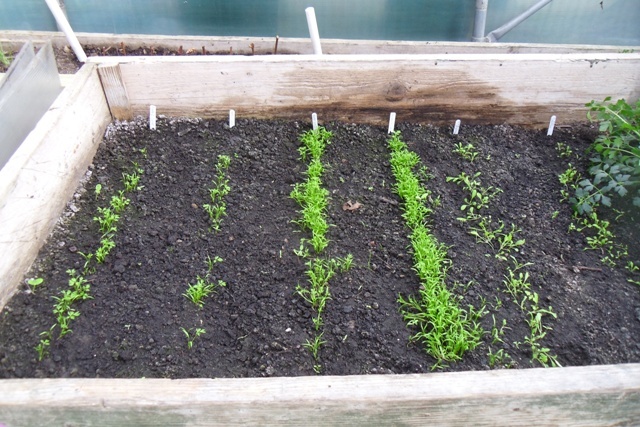 Carrots and rocket growing away well. 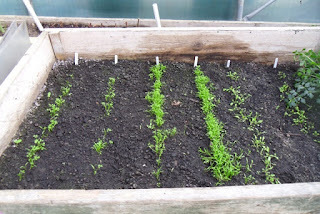 We sowed thick because it was an old packet of carrot seeds... They were obviously still very good! Spinach beet raring to go. 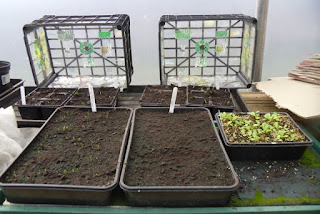 At the back, from left to right: red mustard; spinach; komatsuna (a bit like a giant spinach, but cabbage family). 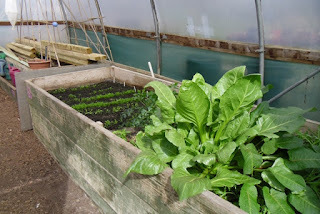 In front, lettuces under their nice new cloche. Perennials and holly waiting for summer. The by-products of pruning: lots of lovely cuttings! Hemlock Happening at Bramcote Park. Cream teas, craft activities, smoothie bikes with Pulp Friction, refreshments, fruit kebabs, jams & preserves, tombola etc. 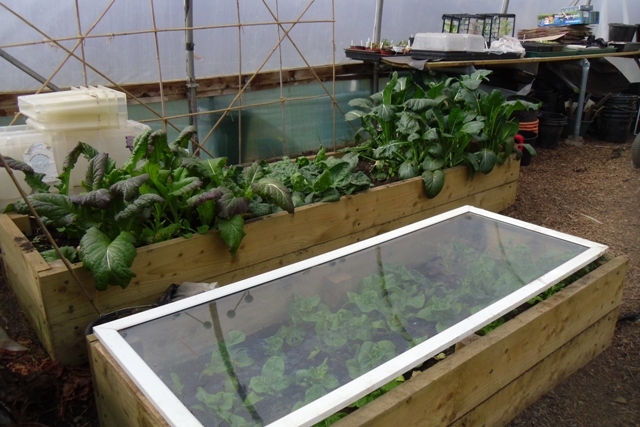 Seasonal produce grown on the allotment will be available for a small donation. Please note new times for events at Dig In. 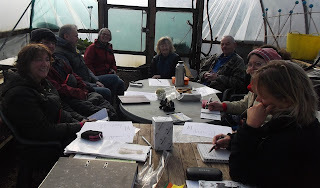 We are planning a walk of about 6 miles which will be fairly easy-going. Starting point and route will be advised hopefully mid April and sponsor forms available then. 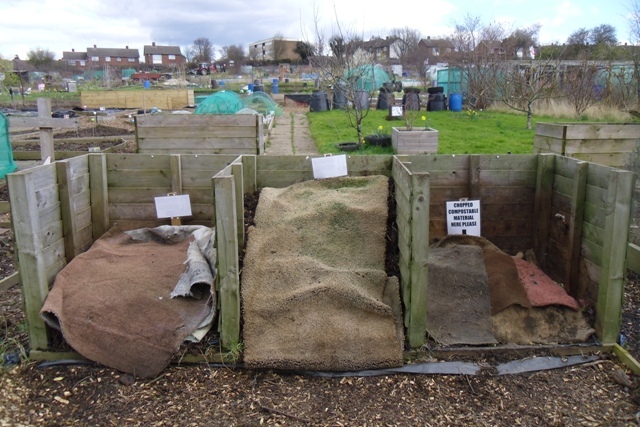 Check blog for details, email the enquiries@ address or call in at Dig In any Weds or Sat between 10am & 12 midday. Get your walking boots on and please help us raise funds for Dig In! Apple pancakes, apple pressing, smoothie bikes with Pulp Friction, pumpkin carving, chutneys & preserves, activities, tombola etc. Seasonal produce grown on the allotment will be available for a small donation. Dig In is run for the benefit of the community by volunteers. 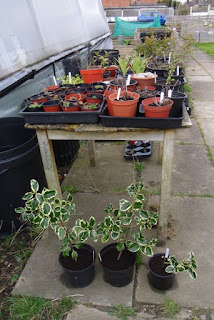 Any donations welcome to help us with running costs. All dates subject to change. Additional events, eg. pond dipping, bug hunts and art workshops are yet to be arranged so please check on Facebook, this blog, or pop in and see us any Weds or Sat 10am-12 midday. 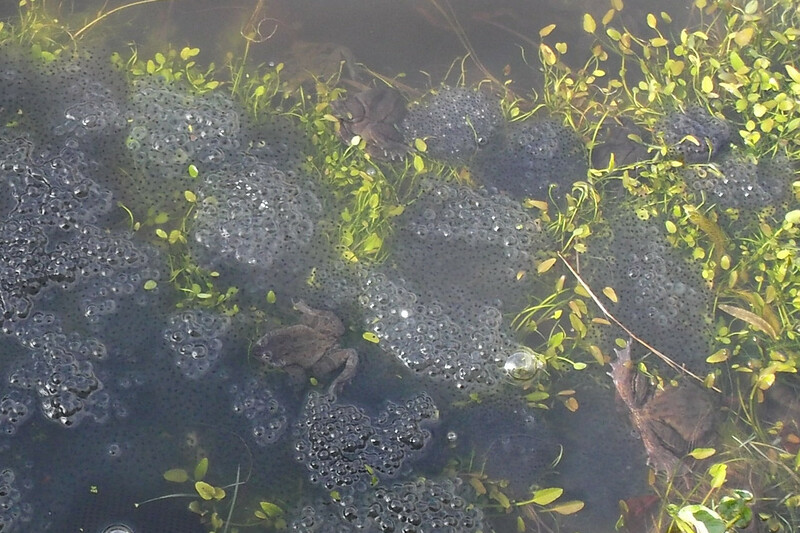 A weekend of two halves for the Bloom event at Attenborough Nature Reserve. 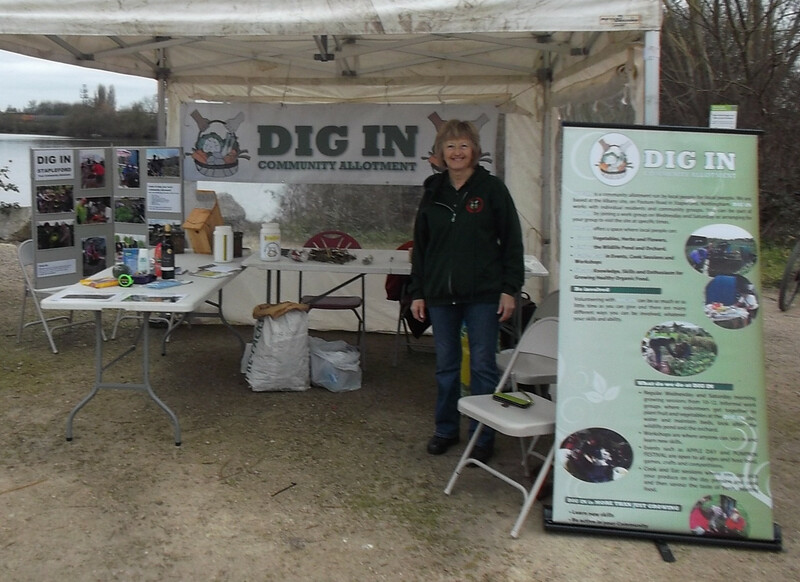 A chilly Saturday and a warmer Sunday was spent at the nature reserve, raising the profile of DigIn Community Allotment to visitors at the reserve. We made bug shelters and planted flower seeds for visitors to take away. The nature reserve is a lovely place to visit, and a bonus for me (being interested in birds), was seeing a few red-crested pochards on the lake - very exotic looking ducks. Here's a pic of Debbie in our tent. Today we were visited by a group from the Stapleford U3A. They had a tour of the allotment and helped in making some bug hotels by cutting hollow stemmed prunings to fit into rinsed-out plastic bottles. 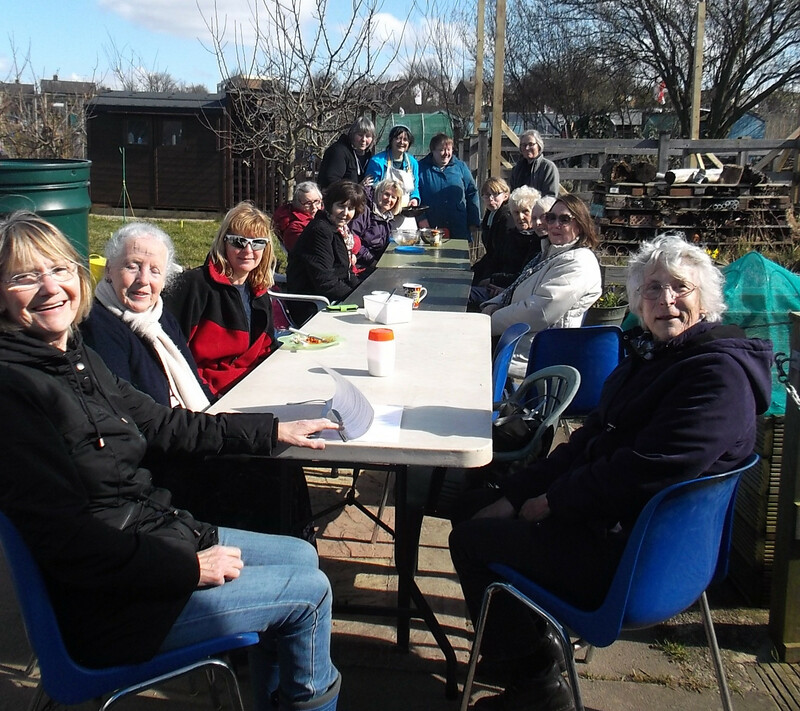 We were all rewarded with a Cook & Eat skilfully prepared and cooked by Mary, Claire and Angela. For afters there were cakes baked by Christina and Karen. 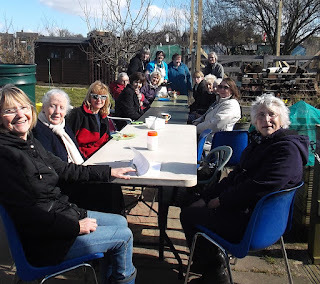 Thankyou to all of the DigIn cooks & bakers for providing such a tasty volunteer session and to the U3A for visiting us - it was a pleasure to have you on site and thanks for your help with the bug hotels. 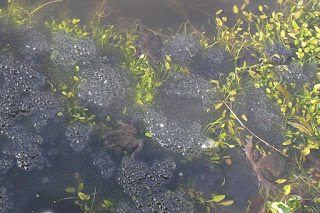 Spring has sprung, according to the frogs & frogspawn in the pond!